This special presentation is for people with dementia, carers, service providers, researchers, businesses and local government representatives. People living with dementia are actively breaking down stereotypes while being supported and empowered to take control of their lives. Prof Steven Sabat says that people with dementia can, in fact, make new memories and they therefore should not be thought of as having ‘memory loss’. For the past 35 years, Prof Sabat has studied the cognitive and social abilities of people with Alzheimer’s disease in the moderate to severe stages, the persistence of selfhood, the subjective experience of having the disease, and how communication between people diagnosed with dementia and their caregivers may be enhanced. He has explored these issues in numerous scientific journal articles, book chapters and presentations at national and international conferences. His books include The experience of Alzheimer’s disease: life through a tangled veil and the forthcoming Alzheimer’s disease and dementia: what everyone needs to know . 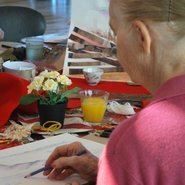 The Art Gallery of NSW has been offering art access programs, particularly for people living with dementia and their carers, since 2009. An independent evaluation of the program in 2016 showed the importance of arts engagement for providing normalcy and social scaffolding to enable individuals to engage with artworks in a supported environment. The Gallery is now working with researchers at the University of Technology Sydney to explore how arts engagement within the Gallery can be extended to develop artmaking practices, and how these important programs can be extended to reach further into the community to allow more people to benefit from arts engagement. Danielle Gullotta and Dr Gail Kenning will talk about some of the early findings of this project, which has been supported by Department of Family and Community Services, NSW.